It’s a known fact that weddings in India are huge events. After all, the whole idea of the Big Fat Indian Wedding has become customary to most Indian families nowadays. A wedding in India gives the couple and their families the chance to be celebrities walking the red carpet, with the paparazzi following them around. A typical Indian wedding goes on for about four to five days. Usually, it includes fun events like the mehendi, sangeet, and cocktail party, in between the more serious and traditional ones like the baraat and the wedding ceremony itself. Weddings in India are truly all about the families, with both the bride and groom’s family members participating with their utmost zest. It’s a union of two families, and nowhere else in the world are weddings such huge occasions as in India. Apart from the obvious joy in the union of two souls and two families, one of the most exciting things about a wedding is the shopping and planning that precedes it. For the Indian bride, it’s not just the several days of wedding events she has to shop for, but for the few weeks of activities and family functions prior to the wedding. More importantly, she’ll need to get outfitted for the first few months after the wedding; after all, she’s typically moving into a new family and home, and needs everything possible to feel and look her best. For most girls, the most exciting part of wedding trousseau shopping is obviously buying the clothes, jewellery and shoes for the wedding events. That’s where she gets to live out her own version of a fairytale fantasy. If you’ve always imagined looking like a royal bride on your big day, this is your chance to shop for the clothes and accessories to make it happen. 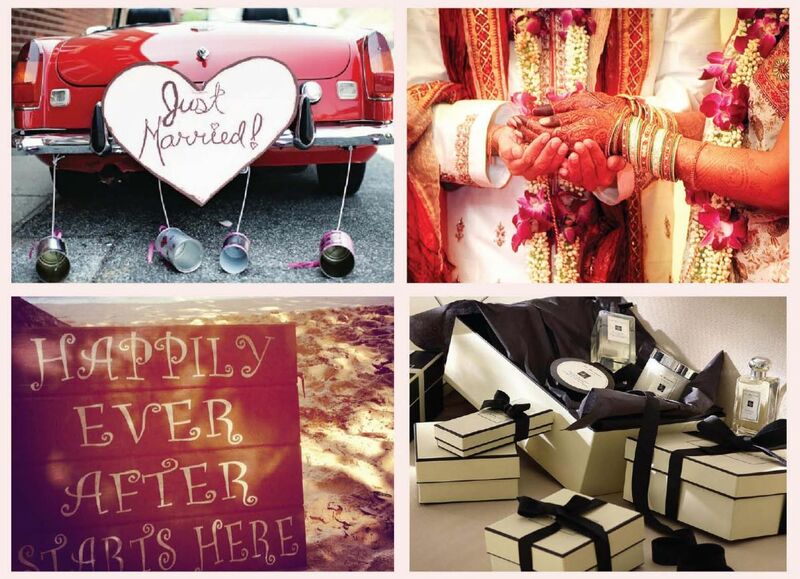 The concept of shopping for one’s trousseau has been around for generations, and is a unique time for the bride. It’s the start of a new chapter in a woman’s life, and she needs everything ‘new’ to mark this special occasion and auspicious beginning. Be honest with yourself, and think about what you like and need that fits in within the realms of both comfort and fashion. If you are a woman who likes wearing Western clothes, then don’t shop solely for Indian wear just because you think this is what a trousseau should be. Be true to yourself. This is the most important tip! As modern as you may be, and even if you are not going to be living in a joint family, it is important to be sensitive to the kind of family you are marrying into. You will be attending a lot of family lunches and dinners, pujas, festivals, and weddings. And during the first year of your marriage there will be a lot of attention on you. Therefore, it is important to be as graceful and elegant as you can be, and this calls for being respectful towards the family’s traditions. Keep your everyday lifestyle in mind before going on an impractical shopping spree. If you’re going to be the lady of the house who will be spending most of her time at home and at social events, you will need to shop for a very different kind of trousseau, compared to someone who will be working for most of the day, six days a week. Research, research, research! It helps to scour the internet and magazines to be able to know what’s out there before narrowing in on exactly what you want. With the ubiquity of fashion trends on social media platforms like Instagram, Pinterest and Facebook, it’s a good time to spend online to know what is available in the market. Have a good idea of all the wedding functions, and keep in mind what time of the day and year they will be taking place. The weather will play a huge role in determining whether to go for the rich velvet Manish Malhotra full-sleeved gown, or a pastel green chiffon cape lehenga. Give yourself enough time to shop. While shopping sounds fun, it can be a lot of work, especially if there is a time constraint. Having ample time to plan and shop translates into getting the most for the money you spend. This is an exciting time for the whole family, and everyone will have an opinion about what the right thing is. Let them all have their say, but ultimately follow your heart; it’s your big day, not theirs. You don’t want to leave the door open for regret. Bridal lehengas and gowns are the most exciting things to shop for because of the sheer variety available. 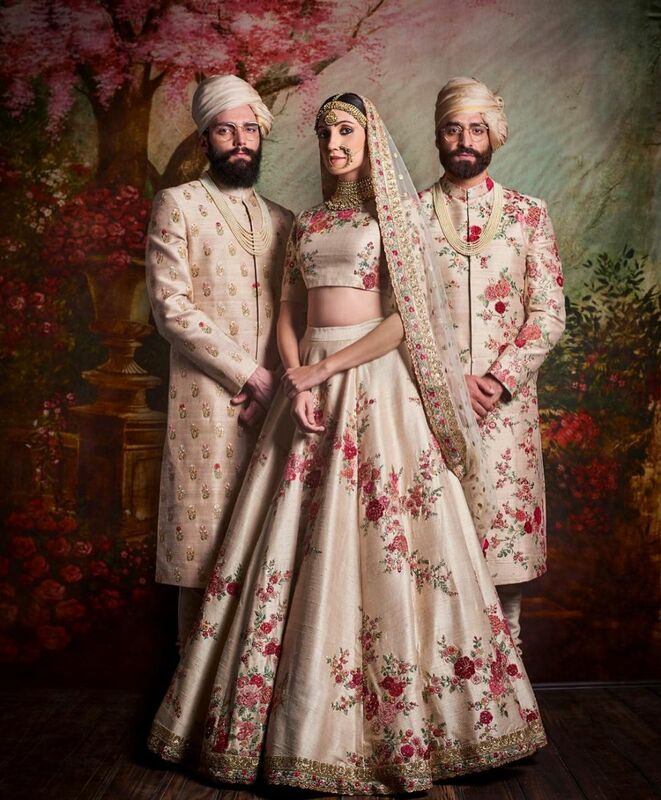 Manish Malhotra, Tarun Tahiliani, Anita Dongre, Abu Jani Sandeep Khosla, and Sabyasachi are some of the most popular designers to choose from for your big day. It is important to keep in mind the theme of each event, to help you pick the right colour, fit, and silhouette. For example, since the mehendi is usually a more intimate, daytime affair that involves sitting a lot in one place, it would be sensible to pick a comfortable outfit in a light colour, allowing for easy movement. The sangeet is usually a time to bring out the glamour and look like a Bollywood star, so lehengas in richer hues, with more elaborate work are great options. A more recent addition to the wedding events roster which ups the glam quotient is the cocktail party. It gives the couple and their friends an opportunity to be Hollywood stars and starlets for the night; it’s glamourous gowns for the women and tuxedos for the men. 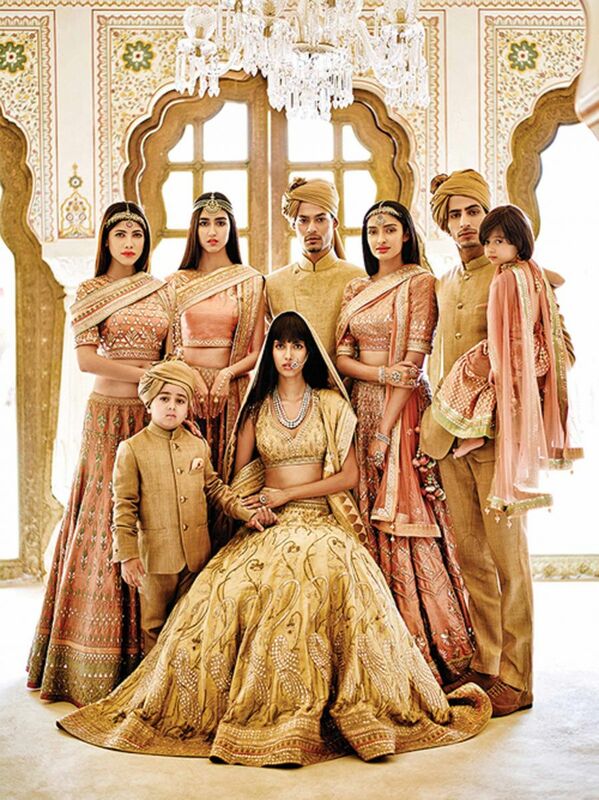 There are a host of new designers who cater exclusively to this segment, like Natasha Dalal, Nadine Dhody and Shriya Som, apart from old-timers like Manish Malhotra and Sabyasachi who have also started making this an important part of their collections. Many brides opt for international designers like Elie Saab, Zuhair Murad, Valentino and Giorgio Armani for their cocktail gowns since they are the epitome of fashion. 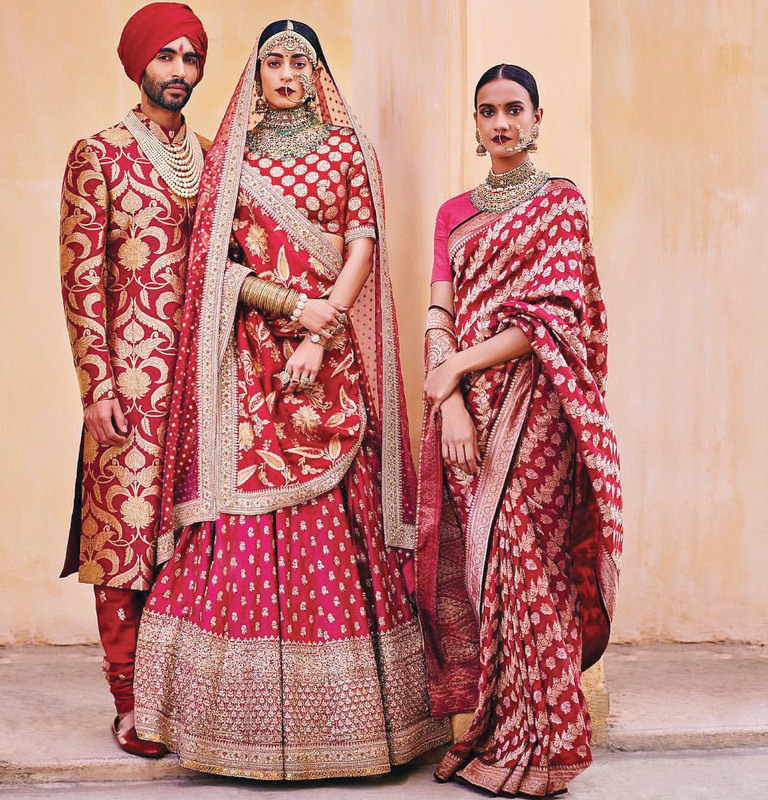 The wedding day is your chance to be the ultimate maharani, and traditional Indian colours like red, burgundy, gold and orange never go out of style. This is the one day you can go all out without thinking twice about whether it ‘looks too much’. Having said that, it is always good to be elegant and not go too over-the-top and risk losing out on your individuality. Once the excitement of the wedding festivities wears off and real life takes over, you’ll realise that you will need a lot of everyday basics peppered with great festive wear for family events. It’s a good idea to stock up on versatile pieces that can be dressed up or down, and the key to mastering this is to only invest in a few pieces without compromising on quality. Buying a few great salwar kameez sets which are simple enough to wear for a lunch, and can be dressed up with statement earrings for a night event, makes all the sense in the world. Sukriti & Aakriti make some beautiful and simple festive wear. If you’re more of a Western wear kind of girl, this would be a good time to buy a few great LBDs, great denims, neutral trousers, and beautiful blouses. The saree is an evergreen outfit, and even if you might not wear it immediately, it will always be put to great use in the future. One of the biggest mistakes Indian brides make is wearing every single piece of jewellery that family members give them. This is a big no-no because it means there is a risk of you ending up looking like an over-decorated Christmas tree. The key here is to choose one statement piece for each function and just stick to it, as tempting as it might be to wear all the beautiful pieces you own. A bride today has a huge variety to choose from – there’s classic diamond jewellery, uncut diamonds or Polki and Kundan jewellery, and South Indian temple jewellery. To risk not looking too alike for every occasion, it’s probably a good idea to plan each look well in advance before beginning to shop. It’s also important to buy jewellery that can be worn again and again once the wedding is over. Very often, brides invest in extravagant pieces for their big day, which may be a bit too ostentatious to wear often, unless at another close family wedding. So buy a good mix of both types of pieces. 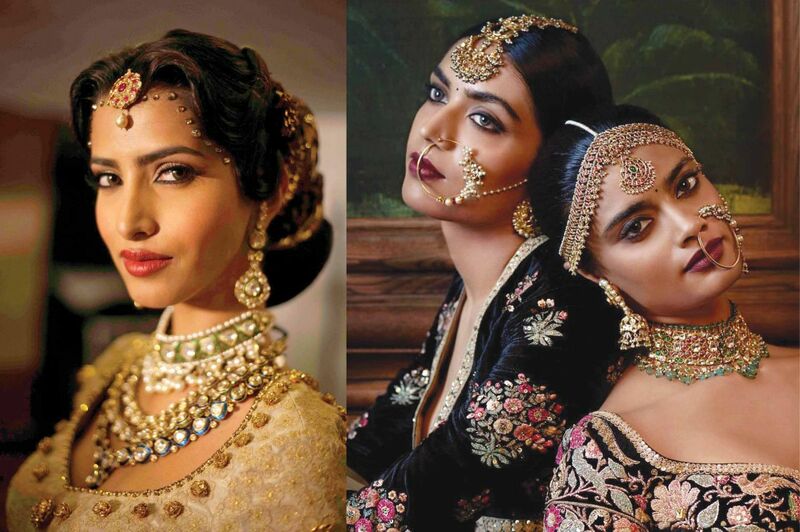 Statement earrings and rings, and maang tikas are huge hits with young brides these days. Accessories can really enhance, or absolutely ruin an outfit! Don’t compromise on the quality of the bags you buy. While a good bag generally costs considerably more, it will go a long way towards making any outfit look polished. And more importantly, there will be less wear and tear, and it’ll last you a long time. For the wedding, super stylish potli bags look better than a big designer brand, since they go best with Indian wear. 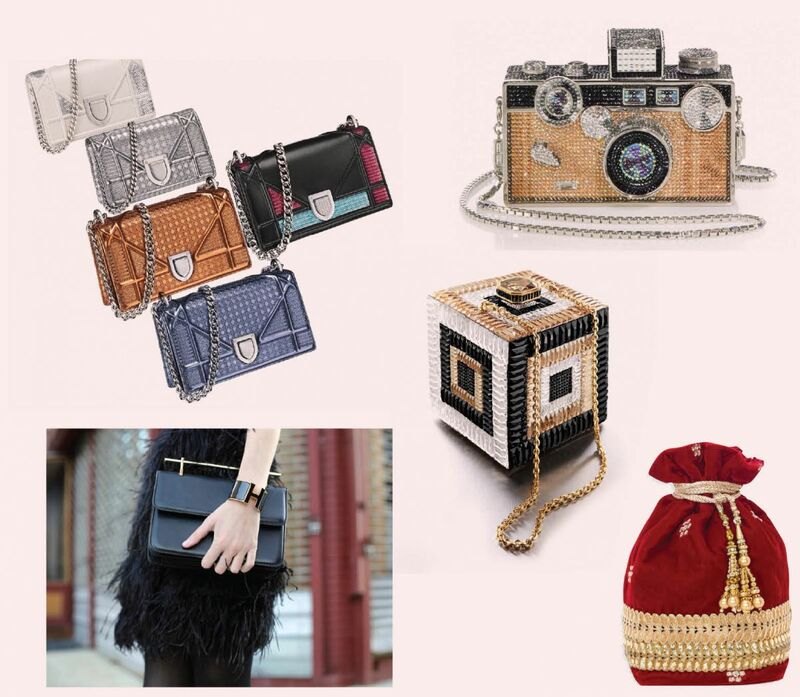 If you’re really particular about wearing branded bags with your Indian outfits, you can choose from the mini and nano collections from brands like Hermes, Dior, Celine, and M2Malletier, in addition to Judith Leiber and Bottega Veneta clutches. It’s important that the bag complements the outfit rather than overpowering it. A good quality bag will see you through the initial months or years of married life, so don’t hesitate to splurge a bit and spoil yourself with a few good bags. Investing in a few good pieces of luggage is also a good idea, now that you have a lifelong companion for your adventures. You’ll be globetrotting across the world, so why not do it in style? Globetrotter, Tumi, and Rimowa luggage bags are always good buys. The higher the heel, the better you feel. Every girl knows the power of a great high heel; it can automatically transform how you feel about yourself. While a great pair of heels is nice to look at and can make you feel like a million bucks, this might not apply to your wedding day, since you are going to be on your toes for several hours. Wearing high heels can tire you out, and nobody looks good when they look like they’re in pain! So for the wedding, say goodbye to super high heels, and hello to flats, or even wedges if you really need a bit of a lift. 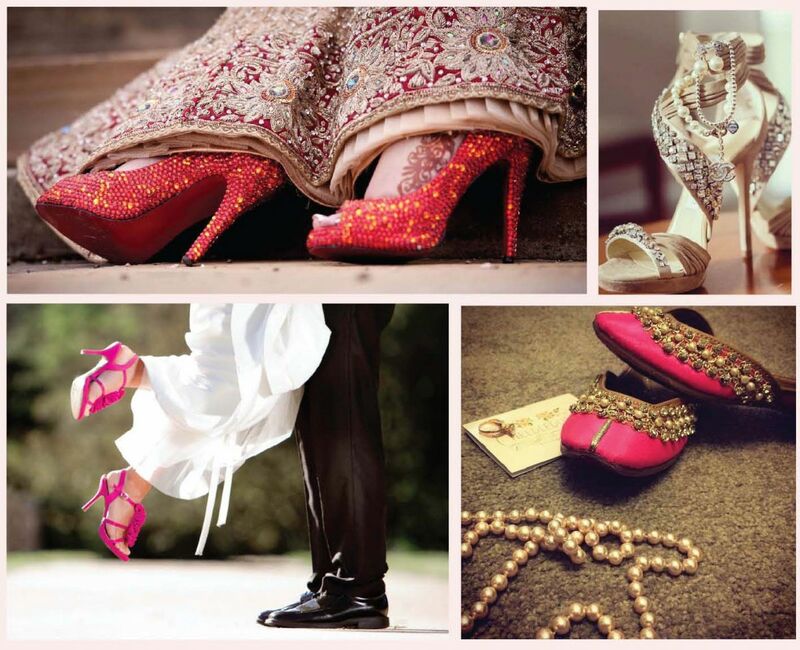 For after the wedding, high heels and flats in neutral colours, along with some bling jootis and slip-ons and stylish Kolhapuris are good additions to your wardrobe. Less is more when it comes to makeup. One of the biggest mistakes that women make on their big day is that they don’t look like themselves with all the layers of makeup they’ve caked onto their faces. The trick is to use makeup to enhance your existing features and beauty, and not let it overpower you. It should make you look like the best version of yourself, and this can only happen if you know what works best for you. For example, if you have great eyes, then use that to your advantage and highlight your eyes with a great eye shadow or smoky eyes, and keep the lips neutral. If you have gorgeous, full lips, then enhance them with a fabulous shade of burgundy, red or pink, and keep the eyes simple. Know what works for you and then set out to buy the best products that are available in the market. This is another area where it’s best not to compromise on quality, since these are products worth investing in. Following the wedding, you’ll still need the basic products that spruce you up and make you look your best. BB creams, mascara, eyelash curler, lipstick, lip-gloss, blush, highlighter, and the right makeup brushes can keep you at your glowing best as a newlywed. Coco Chanel once said, “No elegance is possible without perfume. It is the unseen, unforgettable, and ultimate accessory”. Smelling great is always a good idea, and now that you are going to be a married woman, spend some time getting to know the different perfumes available in order to make one your signature smell. Apart from all the big brands that make perfumes, there are some truly bespoke brands like Le Labo that can customise a smell based on the different smells that appeal to you. Now that’s true luxury! It’s only natural to feel a bit homesick once you move out of your family home and into your husband’s home. No matter how loving they are, you are bound to miss your parents, siblings, and friends. Although they are probably just a phone call, car or plane ride away, it means that they’re not there when you come back home after a long day, or whenever you’re missing them the most. 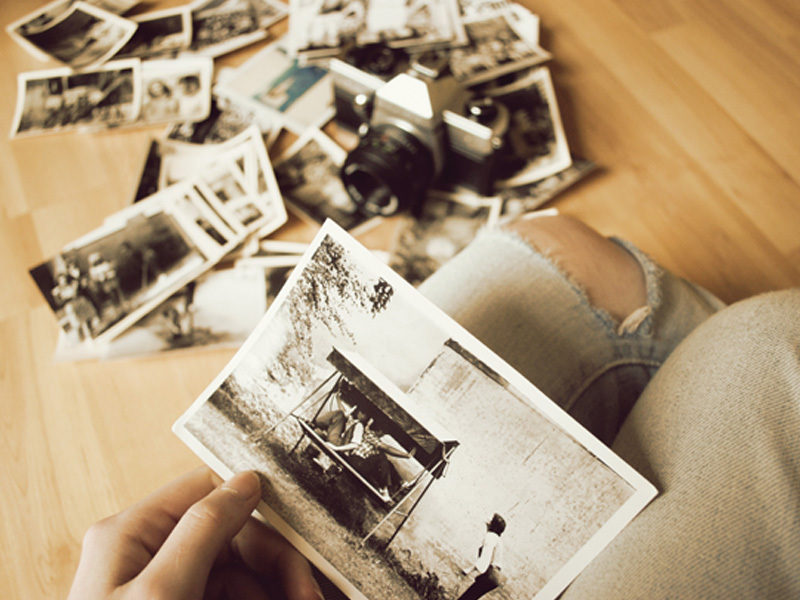 Why not carry along a few memories of your old life into your new home, to comfort you while you’re settling in? Photographs, books, paintings and cards will provide the nostalgia quotient at just the right times. Home is where the heart is. 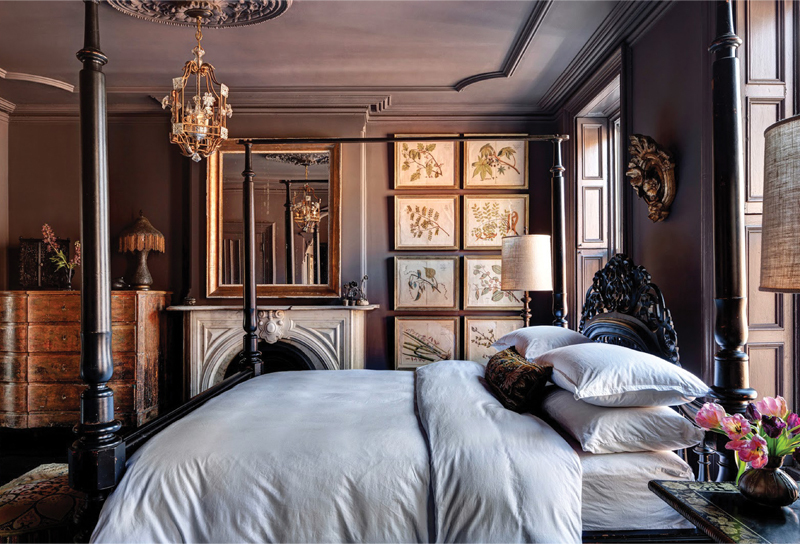 And once you embark on the journey of wedded bliss with your significant other, a big part of the initial months or even years is about making yourself comfortable in your new space, and adding your own touch to either your husband’s home or a new space that you and he share together. Start collecting monogrammed bed linens and towels, along with your favourite bath products and toiletries to help you create a warm and cozy atmosphere. Olatz makes some truly luxurious linen, as do Ralph Lauren Home, Versace Home and Simone. Jo Malone and Santa Maria Novella make some truly wonderful bath products which are always great additions to a new home. What could possibly be more exciting than the wedding itself? The honeymoon! While many modern couples would have already travelled extensively together before the wedding, there are still plenty of more traditional marriages where the couple have yet to go away together for the first time. And the honeymoon is their first intimate holiday together. This sort of occasion calls for some seriously stylish and sensual clothing that will make you feel confident and look great on your holiday. The first rule is to stock up on stylish and tasteful lingerie. Victoria’s Secret, Agent Provocateur, La Perla, Intermissimi, and Pleasurements offer the highest quality innerwear, often specially made for brides on their honeymoons. Apart from lingerie, robes, night suits, cover-ups, and swimwear are important pieces to have for this special trip. Depending on where you’re going, buy good quality investment pieces, like an off-shoulder dress or blouse with a printed skirt if you’re going to gorgeous beach locations. If you’re heading to a big city like London or New York, investing in a statement coat will make you look super stylish.